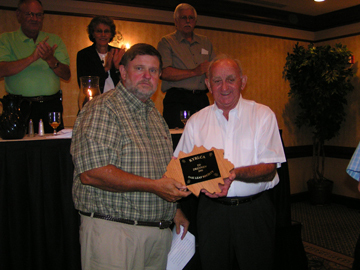 2010 had two inductees into the Oak Leaf Society, Ed Drennon and Janice Ford. The quite man with the biggest smile, was Ed Drennon. Ed was a union supporter anyway he could serve. Even after retiring, Ed would attend mail count seminars so he could help carriers learn how and what to count. He was a state delegate and national delegate. His seat was by the door at the state conventions where he served as sergeant at arms for many years. Presenting Ed his oak leaf is long time friend and travel buddy, David Darrell. Janice Ford always loved a good joke. She was a favorite to emcee the state banquets. She always had a joke on someone in the crowd. 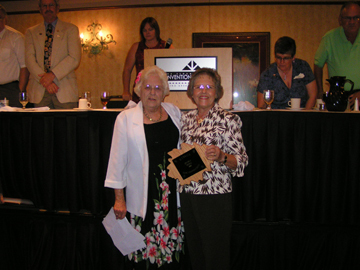 She served as a board member and as state president. Her and husband, Donald Lee worked tirelessly for the association. Congradulations on receiving this honor.